This cheesecake is for serious chocolate fans only. Got that? 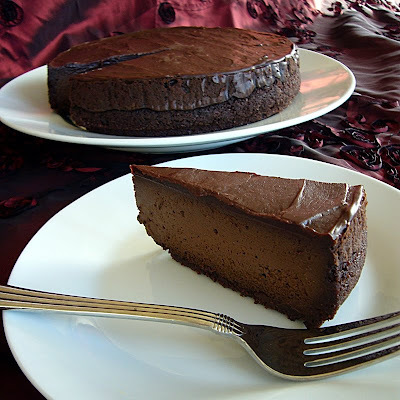 Rich, dense and silky, it is loaded with chocolate flavor. Did I mention rich? Okay, you strong few that have stuck with me... let's proceed. Preheat the oven to 350. Prepare a 10 inch spring form pan with butter and parchment. In a food processor grind the cookies into fine crumbs, add the sugar and pulse to mix. Melt the butter and add it to the sugar crumb mixture and pulse again. Take this mixture and press it into your prepared pan. Bake for 10-12 minutes and allow to cool on a wire rack. Leave oven on, place a shallow pan half full of water into the oven reserving the lower middle rack for the cake and reduce heat to 300 degrees. This will increase the oven's humidity and help prevent surface cracking. Chop the chocolate and place in a double boiler, once melted set it aside and allow it to cool. Fit your stand mixer with the paddle attachment and on medium speed mix the packages of cream cheese for 3-4 minutes till the texture is smooth and uniform. Add the sugar in a slow stream to the bowl while mixing. Mix the salt, cocoa and flour together and add to the batter, mixing well. Reduce the mixer's speed to low and add the sour cream, vanilla and melted chocolate and mix to combine, scraping down the sides of the bowl. Add the eggs one at a time, allowing each to be incorporated fully before adding the next. Take care not to over beat as the eggs allow air to become trapped in the batter. Pour batter into the crust and place into the oven for about an hour. Place the cake on a wire rack to cool. Once cool, refrigerate 4 hours or overnight before serving. If desired, dust cake lightly with cocoa powder or top with chocolate ganache. Heat heavy cream to barely boiling and pour over chips, mix till smooth.